This book challenges the notion that economic crises are modern phenomena through its exploration of the tumultuous 'credit-crunch' of the later Middle Ages. It illustrates clearly how influences such as the Black Death, inter-European warfare, climate change and a bullion famine occasioned severe and prolonged economic decline across fifteenth century England. 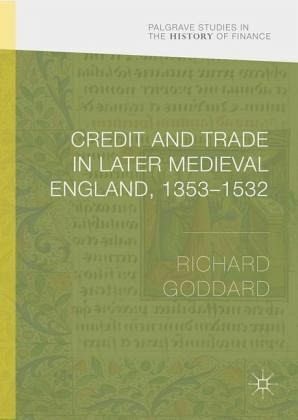 Early chapters discuss trends in lending and borrowing, and the use of credit to fund domestic trade through detailed analysis of the Statute Staple and rich primary sources. The author then adopts a broad-based geographic lens to examine provincial credit before focusing on London's development as the commercial powerhouse in late medieval business. Academics and students of modern economic change and historic financial revolutions alike will see that the years from 1353 to 1532 encompassed immense upheaval and change, reminiscent of modern recessions. The author carefully guides the reader to see that these shifts are the precursors of economic change in the early modern period, laying the foundations for the financial world as we know it today. Richard Goddard is Associate Professor of Medieval History at the University of Nottingham, UK. He is author of Lordship and Medieval Urbanization: Coventry, 1043-1355 (Woodbridge, 2004) and co-editor of Survival and Discord in Medieval Society (Turnhout, 2010). He has written extensively on the economic and social history of later medieval England. Commercial Powerhouse.- Chapter 6) Conclusions.